We play a pitched battle with 4 objectives to get. Shep wins the roll and chooses to deploy and go first. Shep lines up most of his army on one side with the whirlwind tucked in the corner and then puts all his baal predators together on another. I place one loota unit in a ruin and the other two on the ground in the center of my deployment for maximum reach. The nobz are in front of everything and then 3 wagons and the buggies behind. I fail to seize the initiative. Shep goes first. Baal Preds unload into my far right loota squad killing 4 of them. Whirlwind shoots indirectly at the bunched up units of 10 lootas but they make ALL of their cover saves. Baal preds and razorbacks shoot into nob bikers and put a few wounds on the unit. Razorback fire wrecks a buggy. Entire army moves forward aside from the lootas and the dred. Nob bikers go max speed with a turbo boost. Wagons move forward 13" and remain clustered together for the KFF save. Buggies move forward 12" and fire into the predators shaking one and wrecking another. Lootas fire at razorbacks and stun one and wreck another. The lone Loota wrecks the command squad razorback. Whirlwind fire nukes the remaining lootas and almost wipes them out. Both units then fail LD tests and run off the table. Baal predators unload into the nob bikers and put single wounds on the majority of them but kill none. The Warboss eats two wounds from plasma and lascannon fire. The librarian detaches from the command squad and then charges the nob biker unit in a suicide attempt to destroy the Warboss and rubberband the unit away from the razorbacks. The Warboss dies in the assault, the nobs that attack back fail to kill him. Grots arrive and move into the ruins aiming for the objective. 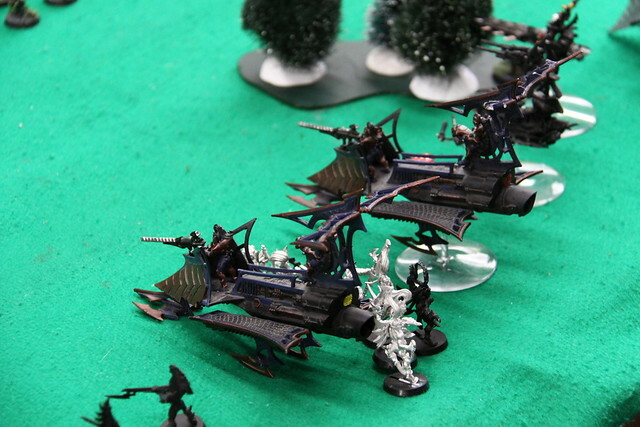 Wagons finally get into range to do some damage: One deffrolla's a razorback and wrecks it. Marines spill out. The remaining two surge onto forward objectives. Buggies shoot at the whirlwind and destroy the weapon. Another buggy unit blows up a razorback and then another wrecks a predator. The deff dred shoots into the command squad unit on foot and kills one marine. In the assault phase the nobs finish off the librarian and then consolidate towards the marines hiding behind the wrecked razorback. Razorback moves forward onto a middle objective and the baal preds split up, several move towards the middle objective threatening the nobs. Another moves towards the grots eyeing the rear objective. Shots are dumped into the nobs again: Plasma from the command squad, lascannons, and baal pred shots. The nobs take several more casualties. They fail their LD test but the bosspole saves them. 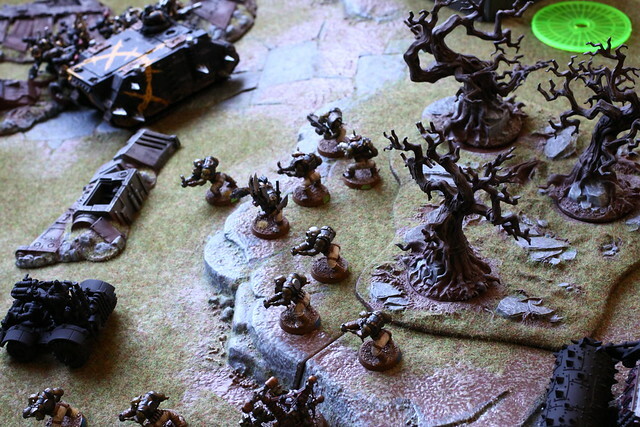 A predator explodes a wagon and the grots fall out and sit on an objective. A baal pred shoots at grots nearby the objective but they go to ground and only take one casualty. Buggies continue to wreck vehicles: They weapon destroy a predator and stun and immobilize another razorback. Another wagon deffrollas a razorback full of marines and wrecks it. The deff dred moves to protect the nearby grots and threaten a razorback close by. The nobs assault the marines that have fallen out of the razorback and wipe them out. They consolidate towards the center of the table. The marines take a swing at the wagon with melta bombs that just deffrolla'd them and immobilize it. Baal preds wreck the deff dred but ignore the nearby grots that have gone to ground. The other preds fire into the nobs and thin the unit significantly, only 5 remain. Buggies move onto an objective to block with the grots and finish off the whirlwind. The hobbled nob biker unit moves towards the razorback sitting on an objective and a nearby baal predator and assults both of them but only manages to immobilize the predator. The last 2 Baal preds and the lone uncrippled razorback finish off the nob bikers. The marines finally successfully assault the wagon standing in their way and blow it up. The grots fall out and stand on the objective. The predator tank shocks them and kills a couple but they hold their line. Plasma spam destroys a buggy unit. The Buggies take pot shots at the marine unit sitting next to the objective and kill a couple of them. The last remaining wagon drops it's grot payload into the forest to score the objective and then deffrollas the last predator and wrecks it. The other grots run towards the objective where the baal preds are sitting. The baal preds turn their attention to the grots camping their objective and fire as best they can but the grots are in cover and go to ground once again and can't be moved. 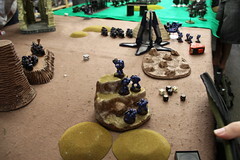 On the opposite side the marines can't deal with all the grots on the objective but do manage to contest the objective. The lone operational razorback sits on an objective scoring it. Buggies are able to contest but not scare anyone. Grots do the same for two of the objectives and manage to score another. 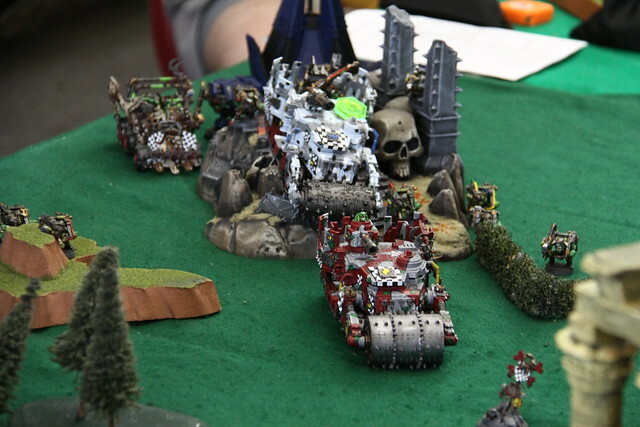 Orks tie Blood Angels 1 Objective to 1 Objective. I don't have a whole lot of experience playing against Blood Angels. But they seem pretty straightforward to play against. Basically marines that move quickly. My list performed like I thought it would and it was interesting to see exactly how much firepower the Nobz were able to soak up. It took Shep a full 5 turns to finally get rid of them and at that point I still had 2 wagons crashing into his vehicles that were largely ignored by most of his anti tank fire for the majority of the game. 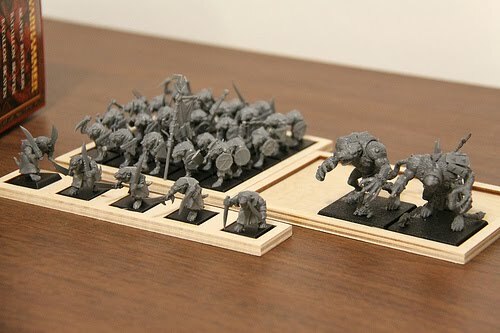 The grots are a bit tricky since they are so terrible and do nothing aside from assist with objective taking. That said they are difficult to get rid of when they decide to go to ground and putting them in an AV14 vehicle certainly helps their survivability. I think this list has a lot of promise. I may make some changes to make my troops a bit less flimsy. Running a minimum nob squad in a wagon is an idea I don't hate and therefore unlocking another heavy slot. The dred was a nice deterrent but ultimately unexciting but I'm not sure what to replace it with. Perhaps a squadron of shooty kanz or maybe I keep the dred but give it skorcha's instead. This was a really fun game overall and I enjoyed playing the list. Primarily because new looks at old codices always interest me. The quest for the perfect ork list continues. "I noticed on ChaosWins that you are using ELO scoring in your 40K tournaments. I am thinking of doing the same for my local store, but I have a few questions for you. 1) What is your starting score for new players? 2) Are you recalculating ELO score between rounds, or just after the tournament? 3) What K factor are you using to get the new ELO scores after the tournament? 4) Are you using the formula 1 / ( 1 + 10 ^ [ Opponent ELO - Player ELO ) / 400 ] ) to calcultate the expected win percentage? I'll take any help you can give me, even if it's just a spreadsheet. For starters I've touched on some of this in this previous article here. 3) For our RTT's we do a K factor of 10. For ease of use I just use this handy calculator located here. K factors are a multiplier for the event. The higher the rating the most heavy the impact the tournament has on a players rating. For RTT's we are using a K factor of 10. If we do a GT in the future? Expect it to be much higher. So it's pretty straightforward with the calculator. Simply determine player A and B and then adjust their scores accordingly after the round. If you want big gains in your score then beat high rated players, and don't lose to scrubs. For you TO's out there, I hope that helps. For you players who are interested in a system like this: Show it to your TO's.